How do you manage files that you keep for reference? When using Paper Tiger, you have the decision as to how you want to differentiate your types of files by creating what we call ‘Locations’ in the database. A Location is a group of like items, and could relate to where you will store your physical items or could relate to the types of physical items that you plan to index (paper files, books, CDs, DVDs, storage boxes, etc.) Your Locations can be named anything you want – however you relate to what you are indexing, i.e., Office files, Home files, Action files, Reference files, House, Basement, Garage, etc. Paper Tiger uses Locations to represent these places where you store the items you want to be able to find later. You decide what is best for the way you wish to file. Remember, Paper Tiger is not just a filing system, it’s a ‘finding system’, so as long as you put in a few keywords for each hanging file folder, you will be able to find anything you need…and when you need it without time-wasting searches. A simple search in the database for whatever keyword you’re thinking of that day, will help you find the file quickly. Paper Tiger experts recommend starting with Locations named ‘Action’ and ‘Reference’. Later you can create an ‘Archives’ Location for those files that you can’t part with for legal or tax reasons, but need to be moved from your general file area. These items can be transferred from one Location to another in your Paper Tiger database so you can still find them if you ever need them. 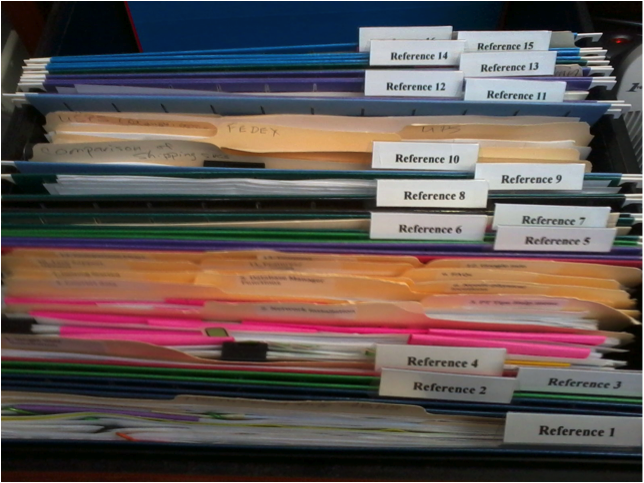 Reference Files are files you need to refer to from time to time, maybe occasionally, maybe once a year, or maybe just hold onto just in case you need to review the file again. For example, your Reference files Location might contain an index of all files in your 5 file cabinets of 4 drawers each, and Item #1 in Paper Tiger starts with the documents in the first hanging file folder in file cabinet 1, and end with Item #500 in with all documents indexed from the last hanging file folder in file cabinet 5. Or you could differentiate your paper files even further with additional Locations such as Clients, Financial, Administrative, Research, etc. As you see these are not in alphabetical order, and of course, they do not need to be since we are indexing our files with Paper Tiger, however you might want to think about what types of files that you want to put together. For example, the files that you will be referencing more frequently in the first 1 or 2 file cabinet drawers convenient to you. The list above would be indexed Reference 1, Reference 2, Reference 3, Reference 4, Reference 5, etc. through Reference 15. The next file that you add to Paper Tiger then would be assigned Reference 16 and would go into Reference 16 hanging file folder. You might also have an Archives Location for the older files that you need to keep for legal or tax or various other reasons for longer periods of time, but most likely will not need to reference again. See our blog posts for Records Retention Guidelines. You would be able to transfer these files in the database from one Location (i.e. : Reference) to the Archives Location so that you can still keep track of where they are. Then move the physical files to the physical location to coincide with the indexed file item number in your Paper Tiger database. (Whatever you change in your Paper Tiger database, you will want to ensure that you match the change in your physical files.) As information, when you transfer files from one Location to another, this opens the Item Number from the original Location for new documents. When a hanging file has gotten too overstuffed, you can sub-divide that file chronologically by year. For example, your hanging file folder Reference 12 for Community Service for 2010 through 2014 could be moved to new hanging file folders with Item Names ‘Community Service-2010′ and ‘Community Service-2011′, etc. If you move them within your Reference Location, they would be added to the first 2 available open Item numbers in Paper Tiger. Or you could transfer them to your Archives cabinet. Reference 12 would then have room for your new current year community service information. For the above example, assuming that Reference Item numbers 1-4 all relate to information that you need for your taxes, you would be able to transfer those files to an Archive hanging file folder (or drawer or box depending on the amount of documentation you have and where you will be moving those documents to) named ‘Taxes-2014′ after you have completed your 2014 taxes. Reference Item numbers 1-4 would then be available for your new current year documents relating to the respective Item Names.